So you're probably wondering what the three different types of solutions are considered when solving a System of Equations, am I right? Huh? Huuh? If you graph two lines and find that they cross at one point the system of equations has one solution. Still confused? Here are some examples of what the 3 solutions look like when you try to solve it! Why you may ask this is a no solution? In the end when you solve everything you ended up with 4=3. WAIT A MINUTE, four doesn't equal to 3!!! That means it has no solution since the equation is false. Every time a solution of the equation is false like 5<3 or 6>9 then that means that the answer is no solution because it isn't true. Ok so you see now that the solution is true as what it says right? 0=0 Right? So the numbers are both equal and the statement is true. As long as the solution is true, like 4<5 or 8>2, then the answer is infinite solutions. Really simple right? 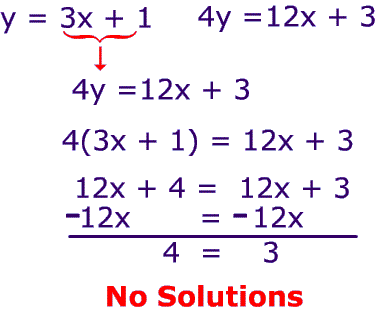 Simple as this, a one solution equation is an equation with only one solution. It's so easy! The equation is -x+y=9 and. 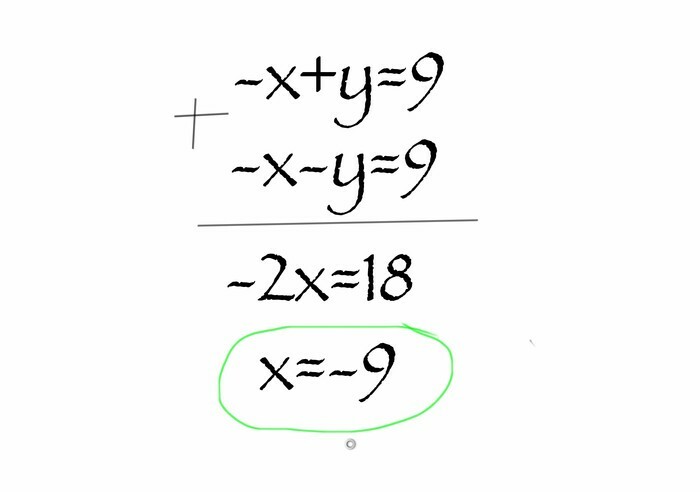 -x-y=9 right? So it's a a negative number plus another number equals 9 and a negative number minus another number equals 9 . Here we must figure out what the numbers are so we can use elimination as a method. Once you solve the equation, you get the answer x=-9 , so there is only one solution you see? That one solution is x=-9 which makes this equation a one solution. SO EASY! Solution? This Video will show you. First you would turn both equations into standard format. After that, you will have to choose a variable such as example, -1x and 3x or 8y and 3y. When you are done choosing the two variables, you will have to find the LCM of the two variables or the Least common Multiple of the 2. Example: 3x and -1x, the least common multiple of the 2 is -3. After that, both equations will have be multiplied by what ever number it takes for the variable (in this case 3x and 1x) to become that multiple or in this case 3. You may be confused so here is an example: (-1x+3y=5) (3) The whole equation will have to multiply by -1 because it is what number -1x has to multiply by to get the LCM of -3. Then you have to cancel out the 17 by dividing it on both sides. After that, you subtract 5 from both sides and should get the answer. Solution? It's in the picture! Click on it to Enlarge! You pay $24.50 for 10 gallons of gasoline and 1 quart of oil at a gas station. Your friend pays $22 for 8 gallons of the same gasoline and 2 quarts of the same oil. Find the cost of 1 quart of oil. I then saw that 8 gallons of gas and 2 quarts of oil was what caused the price or what you would say to be the Independent variables of the equation. So then I wrote, 8x+2y=22. I had now solved the requirement to turn this word problem into 2 equations. To find the cost of 1 quart of oil, you would have to first figure out what method you would like to use to solve this equation. 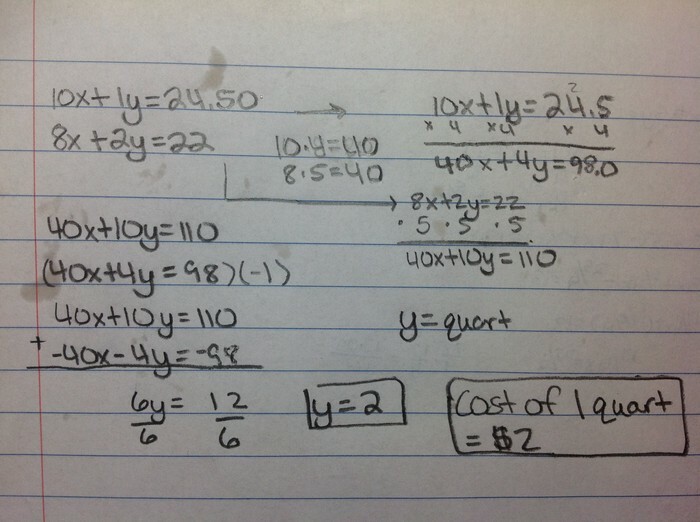 I used elimination because I only wanted to solve for the cost of one quart or for y. So what I did was to use the method of elimination. I chose to eliminate 10x and 8x because I only need to solve for y. So I found the LCM of 10 and 8 and got 40. Saying that, I then got the equations: 40x+4y=98 and 40x+10y=110. I divided 6 on both sides to cancel it out. A rental company charges a flat fee of x dollars for a floor sander rental plus y dollars per hour of the rental. One customer rents a floor sander for 4 hours and pays $63. Another customer rents a floor sander for 6 hours and pays $87. Find the flat fee and the cost per hour for the rental. Answer to Word that problem you say? Here, I had to make an equation first before solving and finding the flat fee and cost per hour for the rental, or in this case, the x and y variables. The flat fee represented x dollars and the dollars per hour, represented y dollars. 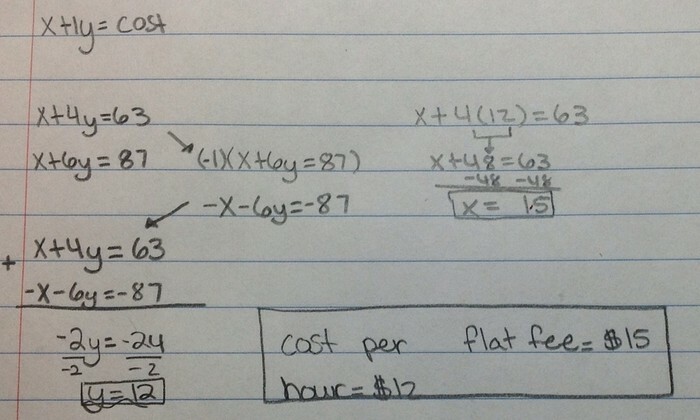 So I found the number of hours rented which is 4 and the total cost is $63 dollars: the equation is then, x+4y=63. I did the same with the other equation and got: x+6y=87. I decided to used the elimination method since I thought it would be the most appropriate thing to use at that time. I chose the variables that I wanted to eliminate to be x and x or 1x and 1x, their LCM is 1. The solution is in the picture on the right! Click on it to Enlarge! When should I use substitution? So now all I would have to do is replace the y in the 2x+3y=10 with x+4 since y= x+4. And then you solve it! When Should I use elimination? Best be for you, if you use elimination when both equations are in standard form or are easy to turn into standard form such as you can turn y=3x+2 into -3x+y=2 easily in a few simple steps. After that all you have to do is find the least common multiples of the 2 numbers that you want to eliminate. 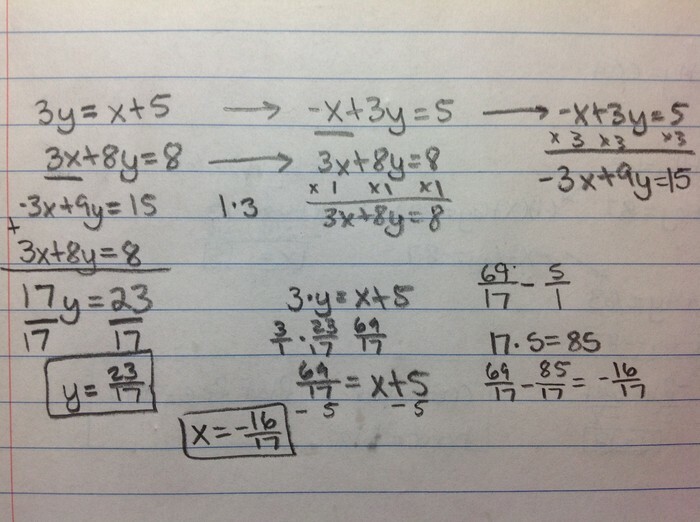 Also you can use this when you want only one answer such as what x equals or y equals. Then you would simply convert y=4x+2 into standard format which would be -4x+y=2. After that, you would solve the equation by eliminating one of the variables that you want by finding the LCM of 2 of the same variables in the equations. Graphing in the system of equations is considered pretty easy of when you use it to solve equations but first of all when should I use it? No brainer, when you have a CALCULATOR or a GRAPHING DEVICE of some sort. Basically after that, another time when you should use it is when you have the 2 equations in slope intercept format (LUCKY YOU) or if you are able to turn the 2 equations easily into slope intercept format. Another time when it is recommended that you use Graphing to solve the 2 equations is that if you want a quick simple method that can give you the answer after you reach the requirements, once again saying this, of turning the equations into slope intercept format if you haven't already or if the equations are already in that form. In this equation, it isn't really recommended that you use graphing in this equation because it would probably take a while for you to convert both equations to slope intercept format (SIMPLIFIED) before you can insert the data into the calculator and let it graph the lines/equations for you. This would be highly recommended that you use graphing in this situation since both equation are already in simplest slope intercept format. That means all you have to do is to plug in the 2 equations, hit graph, find the intersection point, and VUALLA! There you should find the (x,y) coordinates of where the lines intersect and there's you answer.